so, you might be thinking, avocado pasta, eh? how’s that taste? let me tell you, it is amazing! i came across this recipe thanks to my awesome friend lyssa, who was talking on twitter about uses for some extra avocados she had. this was one of the recipes that she was going to try + a quick glance at the ingredients list revealed that i, too, conveniently had everything i needed to make it. yippee! so, the following day, i make a few tweaks to the original recipe (all reflected below – more lemon, less salt, no rinsing of the pasta, etc.) + whipped up this creamy avocado sauce with angel hair. holy moly, it was delicious! the rich creaminess of the avocado is cut perfectly by the bright acid of the lemon, while the garlic adds depth + great flavor. i topped mine with a fresh pepper, lemon zest, + (of course) a bit of freshly grated parmesan. i was absolutely thrilled with the results! a note – the original recipe said that the sauce didn’t reheat well due to the avocados in it (they can discolor + their texture can change with reheating). i made this on friday, reheated some of it on saturday, + some on monday (i’m a rebel!). it reheated perfectly well each time, perhaps due to the lemon balancing out the avocado in the sauce? i’ll leave it up to you whether you want to reheat it or not, but i had no problems, which meant i got enjoy it three separate times. yum! 1/2 – 1 lemon, juiced + reserve the lemon zest to garnish *1/2 lemon will give you a more subtle lemon flavor, while a whole lemon gives a more pronounced lemon flavor, which i love. bring several cups of salted water to a boil in a medium sized pot. add in your pasta + cook until al dente, according to instructions. meanwhile, make the sauce by placing the garlic cloves, lemon juice, + olive oil into a food processor. process until smooth. add in the avocado + salt. process until smooth + creamy. when pasta is done cooking, reserve 1/2 cup of the cooking liquid, set aside, strain pasta + place pasta into a large bowl. pour on the avocado sauce, some of the cooking liquid if needed (i used about 1/3 cup of mine), + toss until combined. garnish with lemon zest, black pepper + parmesan cheese (optional) to taste + serve immediately. This looks just wonderful! With all of the holiday baking/entertaining right now, I am actually craving some “lighter” dishes and this definitely makes the list. I’m a rebel, too, and since we’re big on leftovers in my house, I’ll take the chance and reheat this! I LOVE avocado! This pasta sounds simple and delicious. Perfect weeknight meal. Thanks for sharing! p.s love your blog! I just happen to stumble upon it this morning! Can’t wait to look through it some more! welcome, joanna + great to meet you! this definitely is a perfect weeknight meal – it all came together in less than 15 minutes, which is just perfect for a busy evening. hope you love it if you try it! There is nothing I don’t like about this. YUM. And no, it does NOT need bacon. ha! so you saw vivek’s suggestion on twitter, didn’t you? i think you’ll love this – i was really pleased with the result, especially the pop of citrus. yum! this definitely caught my eye. Super creative! thanks, alison! i definitely thought it was one of the most creative uses of avocado i’ve seen yet. thanks to my friend lyssa to introducing the recipe to me! what a wonderful idea! this is a great way to get that creamy sauciness, but without the zillion calories from cream and butter. can’t wait to try this! thanks amy! you are so welcome! when i made this, i couldn’t believe there was zero cream + zero butter in it – the avocado really lends a wonderful creaminess + has the benefit of all those good fats. hope you love it when you try it, rachel! I wish I was talented & creative enough to come up with recipes like this. It never would have occurred to me to blend avocado with pasta, but good heavens this looks delicious. My husband uses his half-Italian heritage as an excuse for us to eat pasta 2-3 times a week (not that I argue). He will LOVE this! Thanks to you & Lyssa for finding & tweaking this recipe! i’m a fan of avocado in any way, shape, or form so the thought of this makes me giddy! I’ve never heard of anything like this (though my friend just told me about a twice baked avocado she had in a restaurant–WHAT!?!?!). holy moly, twice-baked avocado? you might have to recreate that + put it on your blog so I give it a try. =) i did have deep-fried avocado before + while it was definitely *not* healthy, it was delicious! hope you love this recipe if you try it! I have just come to love avocado in the past few years. I think I related it to the awful mushy guacamole in stores & some restaurants. Once I tasted it as it should be I have been loving it in salads and on sandwiches. This is a new twist as a pasta “sauce”. Intriguing. I’ll have to give this recipe a try. i’m the same way — i didn’t really enjoy avocado until the last few years + now i love it! definitely let me know what you think of this sauce if you try it. i was incredibly surprised + pleased with how deliciously it turned out! When my sister was studying abroad in Chile she said that a traditional dish was to mash an avocado, mix with olive oil & salt & pepper and serve with spaghetti. We’ve made it a few times and it is delicious. I bet your additions would make it ever better! ooh, i don’t know if i’ve ever had avocados with sugar – i’ll have to give that a try! this recipe has me thinking of all the cool new things that i’ve never thought of making with avocados — desserts, cocktails, + who knows what else! This looks SO GOOD! I think avocados can be used for so much more than guac…although that’s awesome too! One of my favorite gelatos at Whole Foods is avocado. It’s so creamy and rich…and it’s the prettiest faint-green color. i think this is the first time i’ve ever used avocados for anything other than guac or avocado cream for dressing + i was so pleased with the result — you’re totally right that they’re much more versatile than we give ’em credit for! oooh, i’ll definitely have to look for the avocado gelato at whole foods – it sounds absolutely amazing! Ohhh I would have never thought to pit avocado in this! Sounds tasty! i knew what you meant. =) i would never have thought to do it either, but it sooo works! 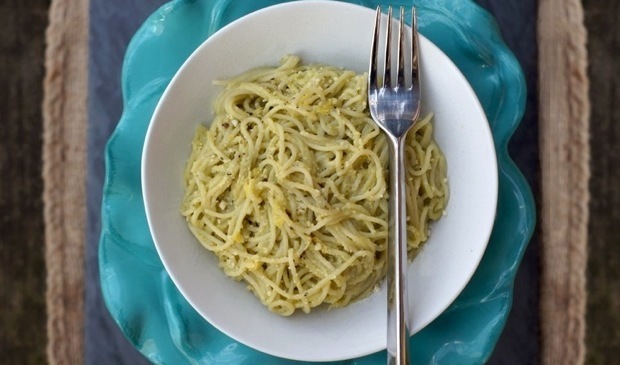 if you like avocado + pasta, you’ll have to give it a try, jess! there you go again. all I want for lunch today is pasta. I’m so baffled….so. incredibly. baffled. bahaha! my mind-reading skills are getting better each day, aren’t they? i’m actually craving pasta for lunch today, too. we should both get totally pastafied today! Jim loves pasta (being Italian and all) but I get so bored with making typical tomato-based pasta dishes, so this was a great change of pace. I never would have thought of making an avocado sauce, but it’s so simple and works wonderfully – we’ll definitely be making it again! awesome! i’m so glad you tried it out + it turned out wonderfully for you + jim. isn’t it great how quickly it comes together? if you served this to guests, they’d never guess that this was a less-than-15-minute-to-prepare dish. love that! Beautiful recipe! I can imagine all the great summer flavours in there. I also like your use of Parmesan cheese in this recipe! It looks like you use the perfect amount! I’d definitely make this if I needed a quick delicious pasta night! I could go for a bowl of this right about now! that makes two of us! i definitely need to make it again soon — it was soooo good! I’ve been meaning to make some sort of avocado pasta dish for months. Yours looks heavenly! I bet the lemon/avocado combo is refreshing!! I was excited to see this recipe because I love avocados but don’t have many recipes for them. I made this last week, and it was a huge hit! I sauteed shrimp to serve on top of the pasta. It was a great combo. Thanks so much. that is so awesome to hear, laura! isn’t is a delicious dish? i absolutely love your idea of serving it with sauteed shrimp, too – great idea! Had this for lunch today & supper again tonight. Will have leftovers for lunch tomorrow. This is awesome! Thank you for sharing it with us, Amy!